Microsoft announced the next version of PowerShell Core this week. The next version will be PowerShell 7 and not PowerShell Core 6.3 as many expected. It signals a significant change in the development of PowerPoint as Microsoft makes another important step in replacing the trusted PowerShell 5.1 on Windows with PowerShell Core. Tip: Check out our PowerShell vs. PowerShell Core comparison to find out how the two differ from one another. 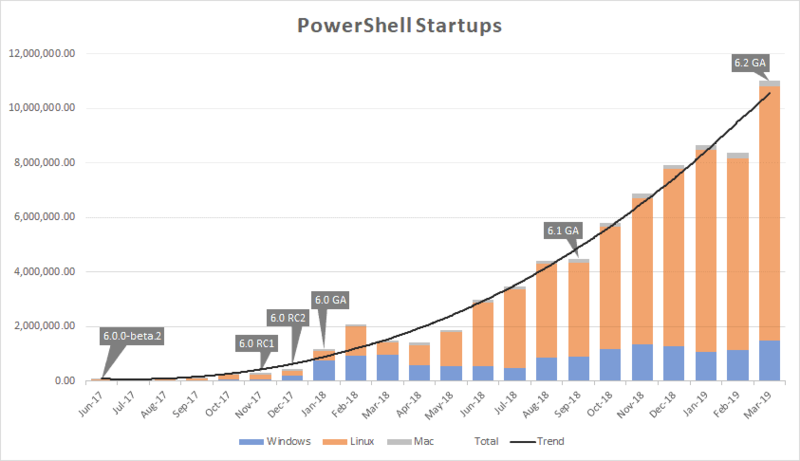 PowerShell Core usage increased significantly in the past two years especially on Linux platforms. Windows usage has stagnated on the other hand for the most part. Microsoft explains the lack of progress on the Windows platform with the existence of PowerShell 5.1 which offers functionality that PowerShell Core does not support. Organizations and users on Windows rely on functions that PowerShell Core does not support, and that is the main reason why usage on Windows stagnates while it lifted off on Linux. Microsoft devised a plan to change that, and PowerShell 7 is the key to the plan’s success. PowerShell 7 is based on .NET Core 3.0 which means that compatibility with Windows PowerShell modules increases to over 90%. PowerShell 7 will ship with Windows eventually; first, as a side-by-side feature with Windows PowerShell 5.1 so that users and administrators may use both versions of PowerShell on the same machine. Microsoft expects the release to become available around May 2019. It depends on the general availability of .NET Core 3.0 and will be released shortly after the release of .NET Core 3.0. Since PowerShell 7 is aligned with the .NET Core timeline, we expect the generally available (GA) release to be some time after the GA of .NET Core 3.0. PowerShell 7 will move from a Microsoft Modern Lifecycle Policy to one that is more aligned with the .NET Core support lifecycle policy. One of the major improvements that comes out of the change is that PowerShell 7 will feature Long Term Service and non-Long Term Service releases. Microsoft did not reveal how it plans to distribute PowerShell 7 on Windows. The most likely explanation is that it will be added as an optional feature first that needs to be installed separately to become available. Plans to replace PowerShell 5.1 with future versions of PowerShell (Core) were not revealed but it seems likely that Microsoft will make a switch eventually to distribute PowerShell (Core) with Windows and make PowerShell 5.1 an optional component. Now You: do you use PowerShell? Ghacks needs you. You can find out how to support us here or support the site directly by becoming a Patreon. Thank you for being a Ghacks reader. The post PowerShell 7 announced: cross-platform, new lifecycle, Windows changes appeared first on gHacks Technology News. What’s new in the world of supplements?